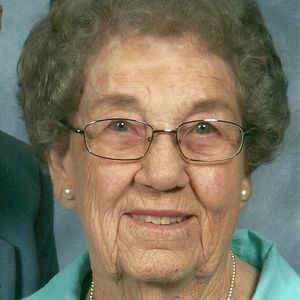 Grace Shields, aged 104, died suddenly on Monday, March 18, 2019, at Keystone Woods, where she had lived for the past seven years. Grace and her husband, Derrill Shields, moved to Anderson IN following their marriage in 1938 and stayed until World War II began in 1942. After the War and several years in Dunkirk IN, they returned to Anderson in 1956, where Grace resided for the next 63 years, the final four without Derrill, who died in 2014, aged 100. Grace was born in White Cloud IN on September 3, 1914, daughter of John Corda Langdon and Nelly P. Chanley Langdon. She was the youngest of four children: Arthur, Ruth, Helen, and Grace. Her father operated small farms near Laconia IN, and she learned cooking, sewing, gardening, and all the household skills needed to live in those hard times. She met Derrill at Laconia High School, where both graduated in 1932. Their long-distance courtship lasted for six years while Grace went to business school in New Albany and worked there and Derrill attended Purdue and began his first job at Guide Lamp in Anderson. After marriage in 1938, Grace continued working as a full-time homemaker and mother for the next three decades, and then she became a long-distance assistant in caring for her grandchildren. She continued to enjoy cooking, playing bridge and Scrabble, sewing quilts, volunteering in the local hospital gift shop, and traveling with Derrill to visit relatives and see the USA into their 90's. Grace is survived by her daughter Janet O'Connell (William), Williamsburg VA; her son David Shields (Nancy), Big Flats NY; and her daughter Jacqueline Odell (Jeff), Morro Bay CA. Her six grandchildren are Edward O'Connell, Richmond VA; Cathleen Ashby (Brian), Annandale NJ; Carter Shields, Reno NV; Jaynie Lanoie (Peter), Clifton Park NY; Jacob Odell (Genevieve), Morro Bay CA; and Jonathan Odell, Morro Bay CA. She is also survived by six great-grandchildren and many close and loving nieces and nephews. Visitation will be held from 11 a.m. to 1 p.m. Wednesday, April 3, at Brown-Butz-Diedring Funeral Service, followed by a graveside service at Anderson Memorial Park. Memorials may be made to Anderson's First Presbyterian Church in lieu of flowers. Add your thoughts, prayers or a condolence to Grace's guestbook.